If you’ve been thinking about joining Greedy Mentor, then you’ll want to read this before you even enter your details on the website. If you’ve already entered your details then it might be too late. The program promises that you’ll earn an income of $1076 per day, wants you to believe that they’re closing very soon and only accepting a very limited amount of people. Then they ask you to fill out a form with your name and email address to get started. They Will Sell Your Data! Now, there are a lot of red flags which leads me to believe that Greedy Mentor is just another low quality, scam program but even if it’s not, there is one thing hidden in plain site that you won’t be happy with. Before you can even buy Greedy Mentor, you have to enter your name and email address and there is no way around it. You can use fake details like I did but eventually, you’ll have to enter your email address to check out. The thing is that Greedy Mentor will sell or rent your email address to people who are looking to buy leads. by clicking the “join now” button you agree to receive emails from “Greedy Mentor”. You will receive emails with great offers and opportunities to make money from home. By clicking the “join now” button you agree to us renting or selling the data you provided above. You will always be able to unsubscribe with one click of a button. The bolded text above is most concerning and I’m betting that most people aren’t going to see it. After all, I almost didn’t read this text. Privacy is an issue that is very important to all of us and you know that is the case when laws like the GDPR which protects the data rights of internet users are passed. What the Greedy Mentor website is telling you is that by entering your email address, you have given them permission to sell your data and you won’t be able to take them to court for it. After you’ve entered your email, you’ll most likely start seeing spam and other unwanted email in your inbox and they’ll be for stuff ranging from make money from home promos, scam offers to unrelated stuff like pills and dating sites. Protecting your data and privacy is one reason to avoid Greedy Mentor. The other reason to avoid this program is that it simply is not going to help you make money. I’d even say that it is a scam offer. I haven’t done a review on Greedy Mentor as yet (I may soon) but I can tell you that some of these red flags just scream scam to me. Here’s a brief run down of some of the obvious ones. Meaghan Harper doesn’t exist. Fake name. The testimonial people are paid spokespeople from Fiverr. They’ll always say they’re closing on the day you’re viewing it. But really they’re not. There aren’t any real limitations to how many people can join. You won’t make $1000+ with this program because it’s crap. And what is with that name – Greedy Mentor? If I wanted to have a mentor, someone who could guide me through the process of making money, I wouldn’t want a greedy one. This tells me that me and my wallet would be taken advantage of and this seems to be the case with this program. I’ve seen one review about Greedy Mentor that I’ve read where after you join, they would ask you to spend $2500 to get a website set up for you. Maybe in the early beginnings of the internet, a website might have cost that much but right now, especially with platforms like Site Rubix, you would easily get started with a website for free. Greedy Mentor appears to be dishonest, manipulative, sneaky and downright scammy and you must avoid this program at all costs. The signs are right there and even if you miss them, you simply do not want to have your data sold so that you can be inundated with spam and unwanted email. 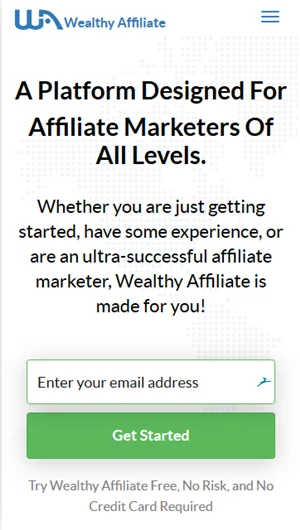 If you’re looking for a legitimate way to learn how to make money online, check out the one place where you can be safe from these predators. It’s my #1 recommended program and you can even sign up to get started without submitting your credit card info. And if you already signed up for Greedy Mentor with your main email, then there’s not much you can do except hit the spam (report) button on emails you don’t recognize. I’d love to know your thoughts about this so please don’t hesitate to comment below. My number 1 pick is Wealthy Affiliate which I mentioned near the end of the article. You can read more about it here.